But back to the peanut butter. When I made a last-minute scramble to the store this past Halloween to fetch candy, I was sure to get one that we liked. I mean, what if no kids show up and you have to eat it all yourself? Turns out, only two kids showed up so, sorrow of sorrows, we had to eat a whole bag of Reese’s PB cups. Well, this recipe may have ruined me on the aforementioned store-bought variety, which tastes like a shot of sugar compared to this dark chocolate, coconutty alternative. I had heard several people mention this homemade version of PB cups recently, and I ended up using a recipe from The Detoxinista blog that proved perfectly simple. I’ve included it below, followed by my own experiments with it (the Easter egg version was a semi success, but needs a bit more product development). 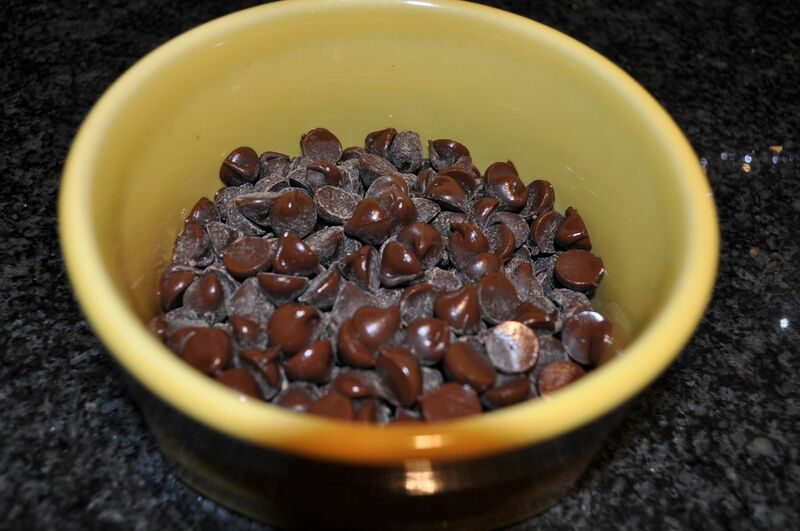 Melt the chocolate in an oven safe bowl in the oven for about five minutes at 400 degrees F. Or you can melt it in a double-boiler or microwave, whatever you prefer. Stir the chips until smooth and liquid. 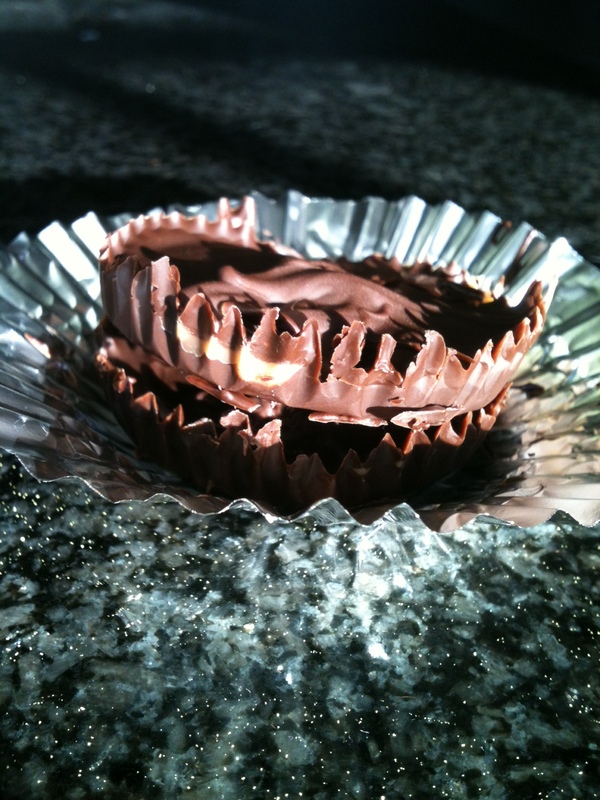 Spoon a small amount of the chocolate into each paper or aluminum cup, enough to just cover the bottom with a layer. Try to draw it up a bit on the sides so the top layer will have something to attach to. Place the cups in a muffin tin and into the freezer for about five minutes. Meanwhile, mix the peanut butter filling. Combine the peanut butter, coconut oil and salt and stir until smooth (may need to heat for a few seconds). Remove the paper cups once chocolate is frozen and spoon a dollop of the peanut butter filling into the center of each cup, trying to avoid the edges. It works best if you freeze it again for a few minutes before adding the final layer of chocolate. Then add the last layer of chocolate over top of the peanut butter, trying to cover it completely and draw it out to the edges of the first layer. Freeze for 5 to 10 minutes… or as long as you can resist! When you peel away the wrapper, they are just irresistibly cute. One word of advice: the wrapper is a must. 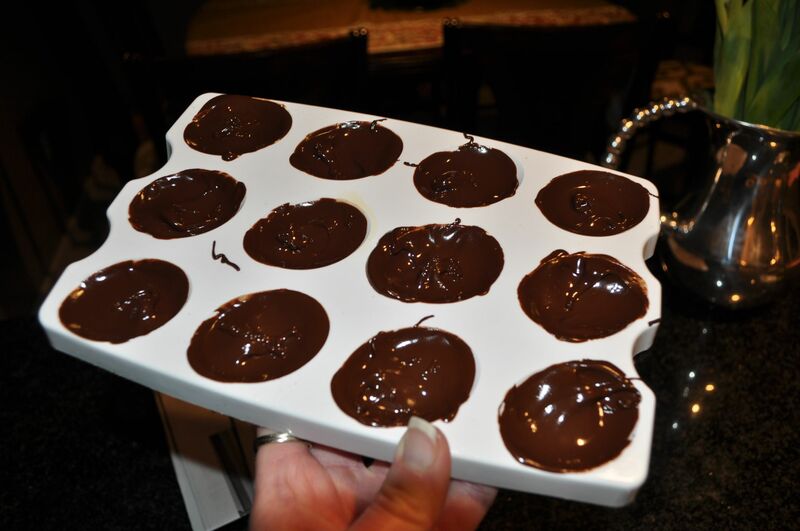 Trying to make these on the fly last week and lacking the wrapper, I decided I would use my deviled egg holder to make egg-shaped PB cups. The idea was not a bad one and one I might try again this Easter, but my first method turned out more like half-eggs with chocolate drizzle than anything the Cadbury bunny would put his name on. This was the last picture I took; it just got uglier from here. They still tasted amazing, but I did break a nail trying to get them out. If you have these simple ingredients in the cabinet, stop what you’re doing and make these right now. Have a glass of milk nearby. Or, even better, have them with a glass of red wine and some Downton Abbey.